The Tre Kronor series continue to be those knives which make Fallkniven stand out amongst the rest and the TK3TW is really no exception. With a handle that is made out of Tigerwood, you may rest assured that the levels of grip on this knife have to be appreciated to be believed. Unfortunately this particular model appears to have been discontinued by Fallkniven but if you’re lucky you can also find a few running around in some of those specialist knife shops. 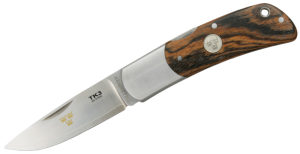 As with all other TK knives, the TK3TW was born after a long and exhaustive refinement process which too several years and which perfected the functional concept of the folding knife as it should be. The TK3 is a hugely secure and extremely solid folding knife with an incredible 3G steel blade which still represents the best value on the market today. The blade can lock in its open position and operates with an excellent and well proven locking mechanism. Each folding knife is manufactured painstakingly by hand and this means that there are small variations between one knife and another. The knife’s folded length is 3.8 inches while the blade length is 2.76 inches with a thickness of just 2.5 mm. The TK3tw is quite light for its size at 100 grammes while the 3G steel is of the nominal 62HRC hardness. The Tigerwood handle material is of the highest quality and ensures the best grip possible. Add the black Cordura leather pouch to the equation and you have a knife package which is truly second to none.